Track listings for the different formats of the new Rainbow live release Memories in Rock — Live in Germany started surfacing. Here’s what we know so far. The 4 bonus tracks will appear on the 2CD edition and will not on the vinyl, both according to German Amazon. Still not clear about the video versions as both those 4 and the 2 Japanese bonus tracks, however, are billed as ‘live video’ on the Japanese Amazon. Japanese DVD+2CD deluxe edition will also come with a commemorative t-shirt. The Blu-ray is already a #1 bestweller on Amazon Japan in the Hard Rock & Metal DVD category. That’s with DVD at #4, another Blu-ray edition at #5, deluxe edition at #6, and yet another DVD edition at #7. 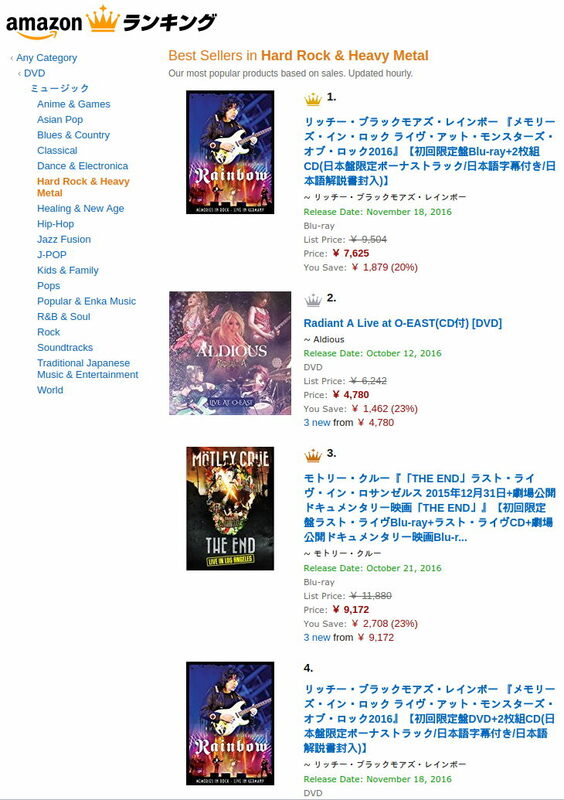 Sure, we get it, the land of the rising sun loves ’em some Blackmore. Release date is set for November 18 in both European and Japanese markets. So far there is no indication of when (or even if) there will be a North American release. Thanks to BraveWords and Akemi Ono for the info. Posted by Nick Soveiko on Saturday, October 1st, 2016, filed under News. You can follow comment on this post through the RSS 2.0 feed. You can skip to the end and leave a comment. Pinging is currently not allowed. Such news it’s a revelation. 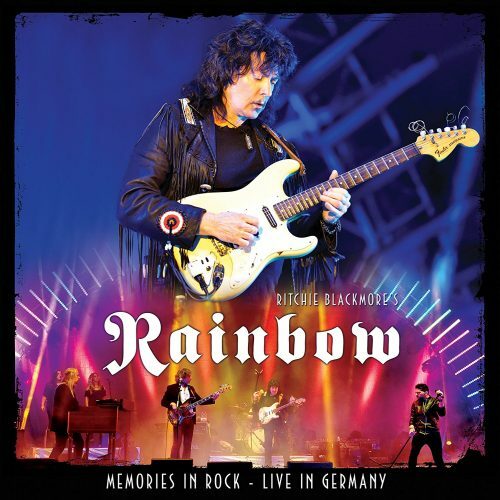 Fair play to Ritchie for getting back on stage with Rainbow after all these years. I flew to Germany and was grinning from ear to ear at the BB show on 18.06. Everything in perspective … appreciate he’s hardly going to play like its 1977 … just enjoy the master back on stage. & then, no doubt, will some weeks later be loaded onto youtube!. No matter, I will still be purchasing it as soon as I can, as is my want. Long live rock ‘n’ roll…. & yabba dabba doo!. Loreley (I was there) was a meagre gig, when I see it from a guitarplaying perspective. As a fan … it was very special to see him again and it was nice and okay. For me in the result … it was lame and underperform. Bietigheim-Bissingen – I ve seen it on youtube – was better than the day before. So the DVD will show us “The Best of … the bad and underperform”. This is a great pity ! The best of the three gigs will only seen on youtube – very pity !! 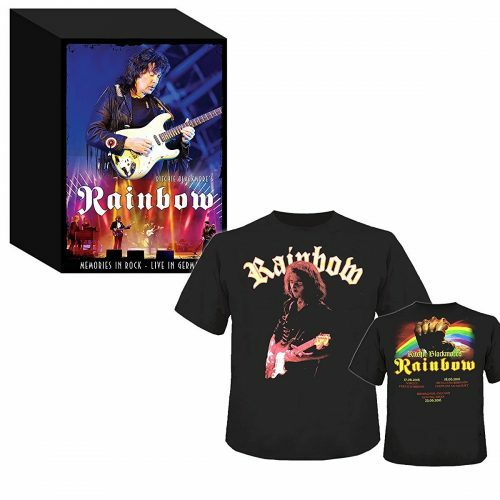 The best item is the tour-shirt showing Ritchie performing, concentrating on his guitar playing. I think it’s a photo from the “Rising”-tour. I was not really impressed while watching the youtube-videos of all three shows. I saw the Germany concerts on youtube and wasn’t all that impressed but thats probably due to the quality of the fans recording more than the actual show. I thought Birmingham was the best and the one that was filmed. Also I dont think that Highway Star and Spotlight kid should have followed one another. I would have started with Highway Star and kept Spotlight kid for the encore.